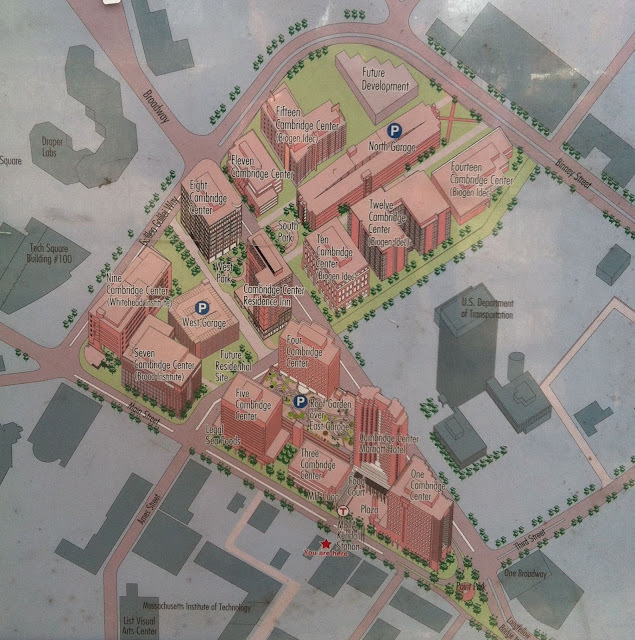 blog.samseidel.org: Kendall Square, a brief historical sketch. 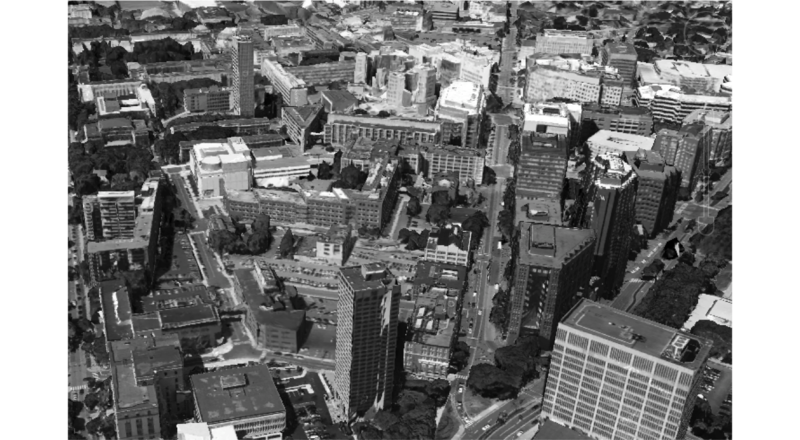 Kendall Square is the story of the life and death and rebirth of an urban landscape in the heart of one of the Northeast's most important regions, the Boston metropolitan area. 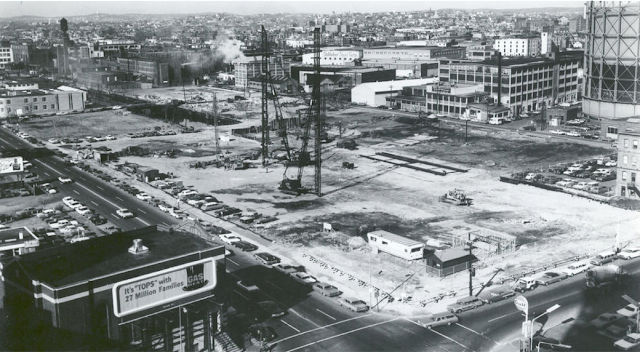 Kendall Square is also the story of the transformation of the American economy from industrial powerhouse immediately following World War II to today's post-industrial knowledge economy. It is odd to look at a 1947 aerial photograph of eastern Cambridge and realize to what degree industry was an integral part of the urban fabric. What today would be referred to as "noxious uses" -- industrial machine shops, gas storage tanks and the like -- were very much woven into everyday life in cities across the country, even in university enclaves like Cambridge. While these uses were often put on waterfronts because in a pre-environmental era flushing waste into water bodies was seen as an acceptable solution to an otherwise challenging problem, these types of facilities were never far from the homes of the customers they might be serving or from the labor they might be employing. The side-by-sideness of it -- industry so near residential -- is very foreign to American sensibilities in most urban centers these days, but it was taken as fact by urban dwellers of all income-strata. 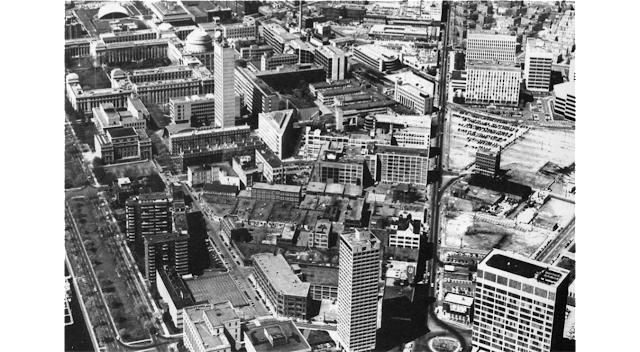 1947 view of Kendall Square with old industrial uses. Residential commences just outside of photo. By the 1960s, times were changing. 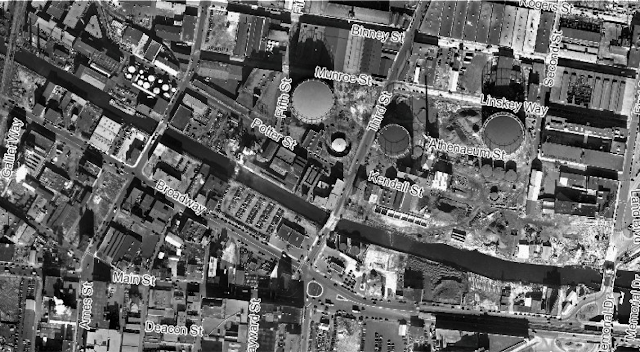 The long-term viability of the city's industrial base eroded while John Kennedy's 1962 promise to send a man to the moon by the end of the decade produced land-use consequences in Cambridge. This was the era of governmental reach and big visions. NASA was in growth mode and chose to site its Electronics Research Center in the city, in part because its administrator James Webb had long-standing ties to MIT. Meanwhile, the promise of urban renewal animated many decisions in municipalities across the country. These two forces combined to radically alter the landscape of the eastern section of Cambridge. The Cambridge Redevelopment Authority worked with all deliberate speed in conjunction with the federal government and local officials to assemble land and clear it. The CRA didn't stop at the boundaries of the NASA property. Everything out to Binney Street was stripped of buildings. NASA unexpectedly departed Cambridge in 1970, the only NASA center ever to close. While there is some speculation that Richard Nixon's antipathy to the Kennedys had something to do with the decision to shutter the facility, it nevertheless left Cambridge with an unpleasant question: once you've created a moonscape, how do you repopulate it with buildings and people? The answer they came up with: do a plan, then find a developer who will build. 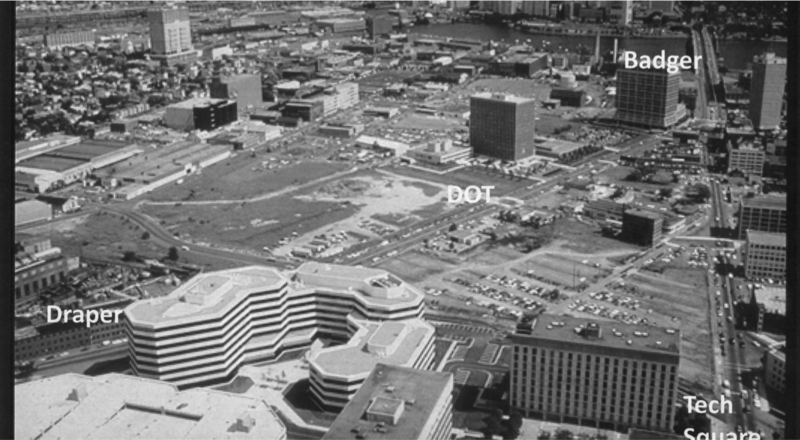 In a decade-long effort culminating in the 1979 agreement between the Cambridge Redevelopment Authority and Boston Properties, the CRA spelled out a grand vision for the land, and the developer promised to deliver. This is the plan that Boston Properties has followed since the initial agreement in 1979. And deliver they did. Over the following decade, Boston Properties constructed close to 2 million square feet of new buildings on lots that had been used for parking. A 1975 photo looking west on Main Street. On the right are the parking lots that will be filled in. A 2013 Google Earth view of Main Street, with the parking lots on the right completely filled in. There is widespread agreement that this urban fabric falls short of current tastes, but back then a building was a very welcomed thing. Cambridge is trying to retrofit this area now, but today's concerns are worlds away from the challenges of 1975.